I recently started feeding Julia cheese, yogurt, and regular table food. At her 9 month appointment, her pediatrician advised us that we can start doing that. I was taken back a little since for the past 3 months I have only given her simple purées. “She has never had garlic, or onions, or any spices at all. Is it ok to feed her all those things now?”, I commented. “Go for it!”, she said. So I went for it. Her first real food was couscous. I love making it since it is so simple and can be served as a side dish or a main dish. I do not follow a particular recipe… I just make it up depending on the ingredients that I crave. This time I added some olive oil, lime juice, olives, spinach, roasted tomatoes, salt, black pepper, goat feta cheese, and alleppo pepper (I love this pepper! If you have a Penzeys near you, grab some and sprinkle it on anything that you desire. It’s delicious!). I was not sure what Julia was going to make of the dish. She just loved it!! The next dish that I made was a potato salad. This is another simple side dish that I love to make and it is a little more interesting than your typical potato salad. I found the recipe in the Lucid Food cookbook. It includes potatoes, pesto, olives, and hard boiled eggs. I did not make my own pesto this time. Also, since Julia cannot have eggs, I did not include them in the entire dish. I also added some avocado on top for all of us. 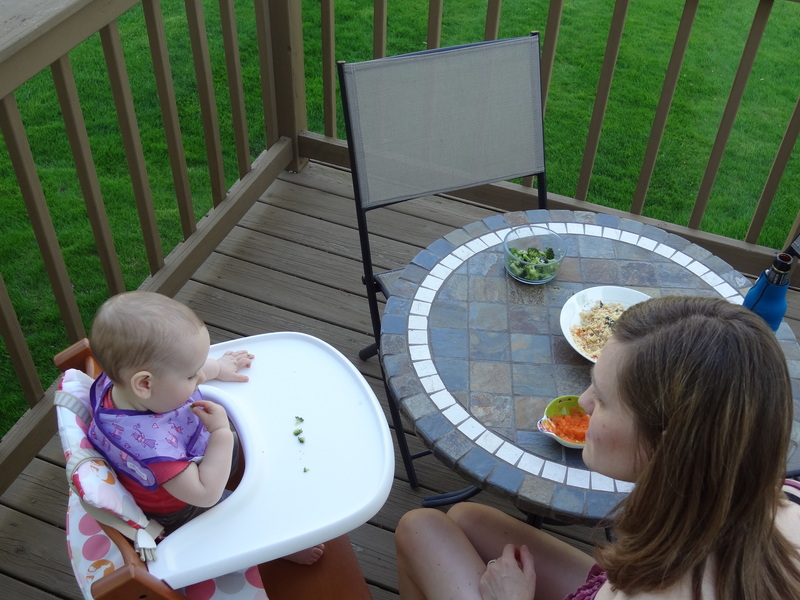 Julia loved it since I gave her pieces of potatoes and avocados to feed herself (she loves feeding herself!). Another success! The next dish was a little different. I was not sure if I wanted to feed Julia meat just yet. Since I do not eat meat or hardly ever cook it, I could not bare the thought of boiling chicken for her. And there was no way that I was going to get her the chicken dishes in the jar. That sounded even more appalling. Also, I cannot roast a chicken for the life of me. So what to do? Then a few weeks ago I found a recipe that sounded somewhat promising. I decided to give it a try. (I know!! Can you believe it!?!?) The dish includes chicken thighs, a few shallots, a pint of cherry tomatoes, 1/2 a cup or so of olives, fresh thyme, olive oil, salt, pepper, fresh mint, and feta. You roast the chicken with all the ingredients, minus the mint and feta. Once the chicken is done roasting, you add the mint and feta. The dish was delicious!! Since we loved it so much and it was easy to make, I decided to make it again and give some to Julia. She loved it too! I must say that since I started feeding Julia regular food, my thoughts about dinner have changed a bit. I feel like I now have to think even harder about what dishes to make, since she cannot eat everything that we eat. For example, I tend to use nuts a lot in my cooking… specifically for pesto. But at the same time, I am super excited that she can now eat more of the things that we eat. It will definitely make it easier to not have to make multiple dinners for us. I also feel super lucky that she is such a good eater. Still to this day, she has only disliked bananas, pears, and cauliflower. If that is the extent of it, I have nothing to complain about, no?